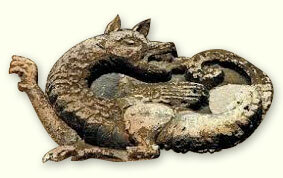 The Ouroboros, a dragon eating its own tail. The symbol of infinity, order and chaos, beginning and end. A circular story which begins and ends on the farm in Kresgeville, where our vineyard stands today. The farm had always been a summertime Camelot. A place of extreme natural beauty and wonder, where a boy from Brooklyn could adventure his heart out. Purchased by my great uncle Dominic and my grandfather Sam three quarters of a century ago, it was the place I always wanted to be. There was no good living to be had in adventuring- except, perhaps, as a Forest Ranger or Game Warden. And so the epic of education began. Beginning in upstate New York (SUNY at Cobleskill), then as west in Kentucky as one can get (Murray State University), then ending up in Georgia (UGA in Athens). By this point in time the idea of being a Game Warden or Forest Ranger had morphed into wildlife parasitology. It was in Georgia that I first got interested in wine in a social context. I really liked people who liked wine. Georgia was also where I first visited a real winery (B & B Rosser Winery in High Shoals-sadly no longer in business). From there it was north to a research position at the USDA in Maryland. Maryland was just a good stone’s throw from the farm. Weekends there were gold. At the same time, I was becoming more comfortable with wine and began making my own, with grapes from California via Brooklyn. One fateful weekend at the farm, my mother’s best friend’s (Mary) father (Mr. D) suggested that I should try growing grapes instead of buying them. So, I did. 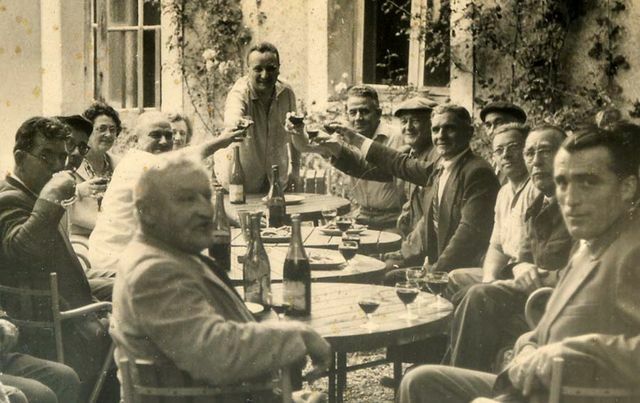 Men toasting in a courtyard (est. 1960) Photograph by Bertrand Celce. It was just a picture that came to be in my head, a simple and innocent provenance. Not an image of wine bottles with medals, black tie dinners, or bags of money. Just an old wooden table with mismatched chairs, set out at the edge of the vineyard. Some fruit, cheese, olives and bread; pitchers of wine and water, and jelly jars. Numinous, rustic, peasanty, and perfect. Around the table are a handful of people. In brilliant focus are the hands of the oldest and the faces of the youngest (the rest were an “image sfumato” al la da Vinci). The hands are stained, cracked and calloused. The faces are smooth and scrubbed clean, eyes wide and bright, ears pricked. Mostly they represent characters from my past with some link to wine. The elders had the elegance of simplicity and a grace born of hard work. Authoritative without the arrogance. They speak softly because everyone cares about what they were saying. It was life that they are talking about, using vines and wine as a metaphor. Past, present and future, just from the shape of a vine or the taste in a sip of wine. Quiet empaths, the vines are not an audience, but members of the same choir. For whatever reason, it appeared while at a crossroad of career and proximity to the farm.